Tatjana Gerhard (Zurich, Switzerland, 1974 / lives and works in Ghent) paints and as an artist restricts herself to painting. Again and again and without discernible preparation she confronts herself with a white canvas and starts to apply the oil paint. Doing so and while painting she invents the world that is so typically hers. Today, Tatjana Gerhard paints on canvas that was semi-industrially prepared. In the past she used to prepare the linen herself. Today she paints with a new kind of oil paint that offers her brighter colours. Other canvas and other paint are only two aspects of her current work that differ from earlier work. A third difference is content-based. Gerhard’s approach remains essentially unchanged. Gerhard paints without preliminary discursive program. For the answer to the questions why her paintings are what they are and why they show what they show, the artist leaves us without words. Which doesn’t mean that she positions herself outside the history of painting. She very well is aware of the essential importance in the art of painting of a painter’s dealing with the relation between motive (the discursive presentation) and background (the pictorial space). Van Eyck and Cézanne, Rubens and Rothko, all of them render different solutions for the same ‘problem’. This specific aspect is today more explicitly elaborated than it used to be in former years. Especially in the three largest paintings from the current show Gerhard is juggling with that for- and background relation. Coloured surfaces that at first seem to be part of the characters rendered, are at second sight actually part of the abstract background that is cut up in irregularly geometric surfaces. Gerhard is utterly fascinated by the blur of place and meaning of the elements of a painting. 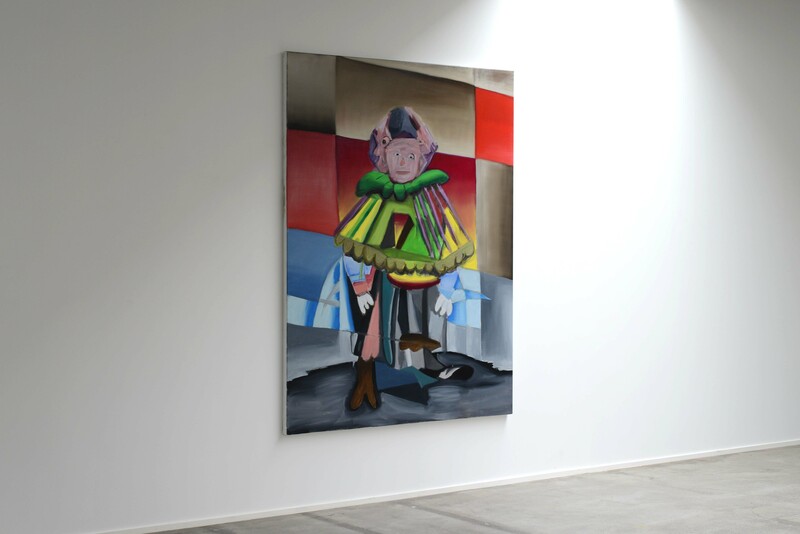 Whereas ‘Ohne Titel’(Without Title)(2013, 200 x 150 cm) in its upper part unmistakably suggests the portrait of a kind of jester or harlequin who is in front of a background that is cut up in big surfaces, in the lower part of the painting motive and background are fading away into each other as a result of the continued smaller division of the surfaces, of the motive as well as of the background. With exception of the three works mentioned, the other paintings from the show represent what one might call (anonymous) portrait busts. We indeed recognize – more or less sharp – eyes, noses, mouths, facial profiles and busts. But even within this recognizable figuration, we discover parts of colour (or for that matter of paint) of which we are unable to say what they stand for. Some parts clearly refer to an element of the representation (for example a bow tie) while others are there only because of themselves, because of their own pictorial esteem. 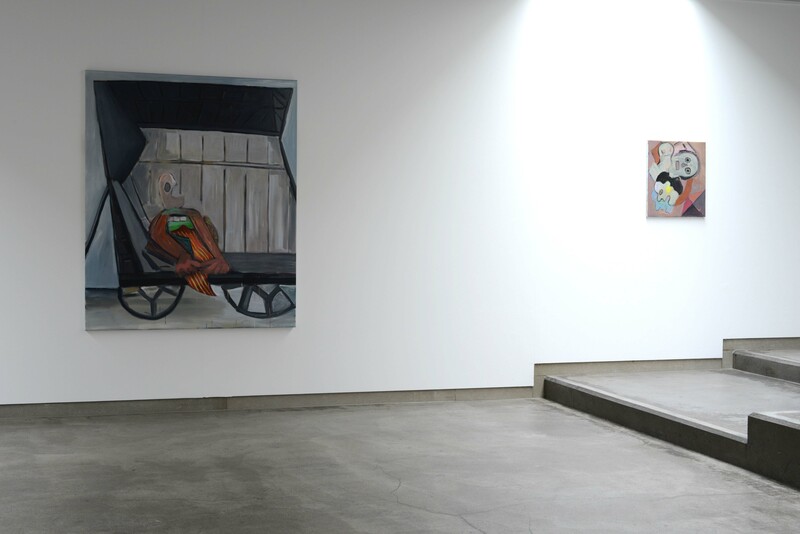 The title of the exhibition ‘Die neuen Sterblichen’(The new mortals) refers to the characters that inhabit the paintings. Gerhard imagines characters that come to existence only in her paintings. Exactly there lies one of the paradoxes of the exhibition: the represented characters are not mortal at all. On the contrary, as artworks they are destined for an eternal life. Their predicate of mortals can be justified only because of their resemblance of human beings. So while Gerhard distances herself in her newest paintings from the unearthly worlds of dream and fairy tales with which her former work was often associated, and approaches our human world by painting ‘portraits’, she at once distances herself from our world by making paintings that are far more pictorially dramatic, autonomous and self-supporting. Again, without consciously having developed a program. Because Tatjana Gerhard continues to begin a new painting only guided by her intuition and with nothing else than say a bright oblique stripe of purple paint. 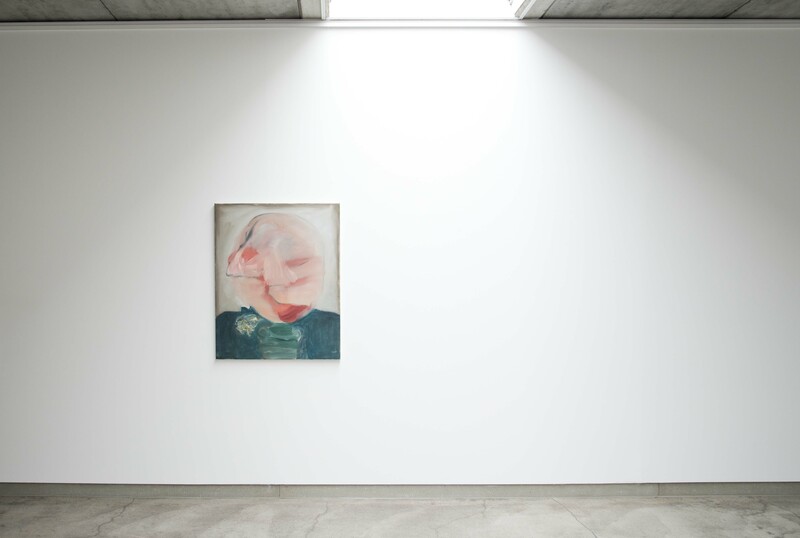 Deweer Gallery introduced Tatjana Gerhard with the solo exhibition ‘Als ob sie alles wussten (As if they knew it all)’ (2010). 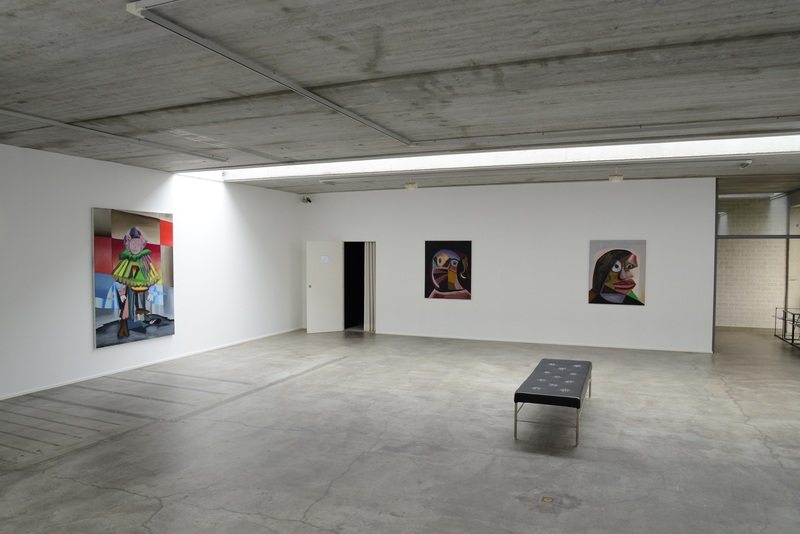 This exhibition was followed by solos in the Helmhaus in Zurich (2010, with catalogue) and the Centre Culturel Suisse in Paris (2011). 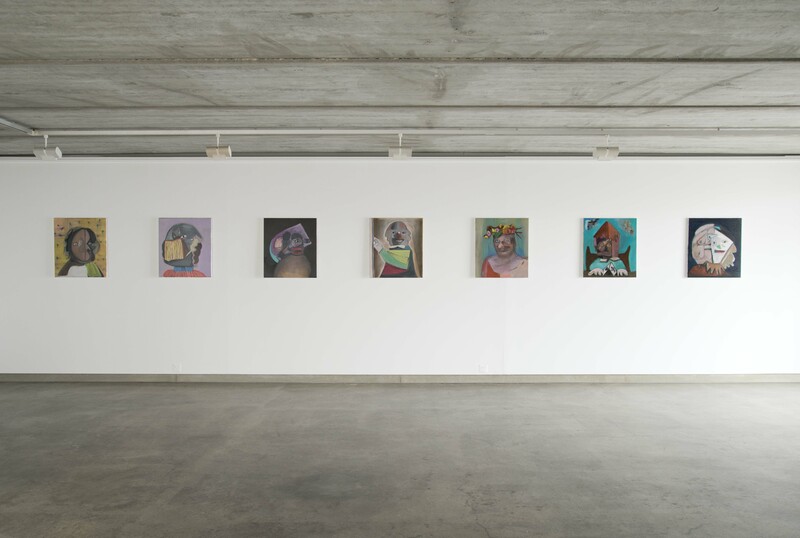 In 2010, work by Tatjana Gerhard was included in two major thematic exhibitions in Belgian museums, in particular in ‘Public Private Paintings’ (Mu.ZEE, Ostend) and in ‘Hareng Saur - Ensor and Contemporary Art (Museum of Fine Arts & S.M.A.K., Ghent). 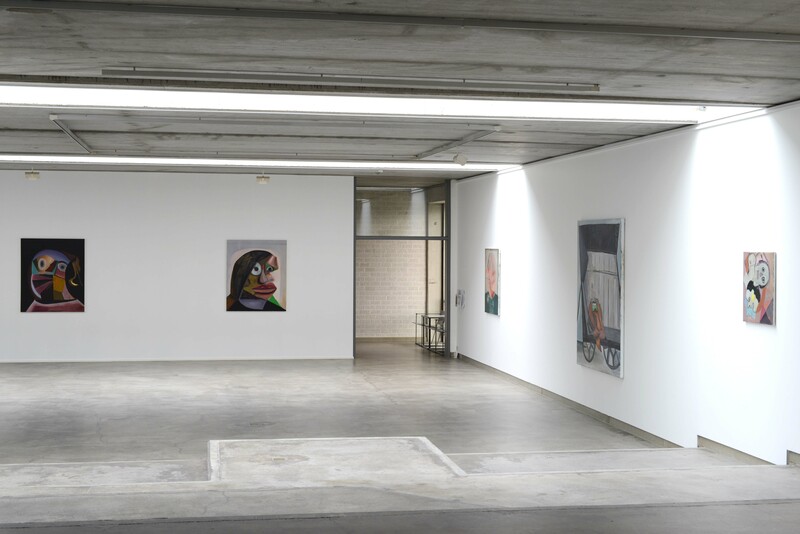 Paintings by Tatjana Gerhard are included in numerous private and public collections, including the S.M.A.K., Ghent and the Kunstmuseum Bern.